Reid, Stuart. Wellington’s Highland Warriors: From the Black Watch Mutiny to the Battle of Waterloo. London: Frontline Books, 2010. 252 pages. ISBN: 9781848325578. $40. I was not sure what to expect when I started reading Wellington’s Highland Regiments. I assumed it would be just another recounting of the various regiments – their battles, campaigns, and uniforms. I was quite surprised when I discovered that Stuart Reid took a different approach. Although he does cover the battles and campaigns, he starts at their origins and works his way through Waterloo. The first chapter covers the infamous 1743 mutiny of the Black Watch and its impact on how all future regiments would be raised. Much of the book covers the raising of the various Highland regiments (at one point 35 regiments were authorized) and the political maneuvering behind the various individuals jockeying for permission to raise a regiment. Once it was received, the new colonel had to compete with others to find recruits for regiment. Mr Reid dispels the myth that the regiments were raised by clan chieftains who called upon their kinsmen and tenants to fill the ranks. Instead, competition was so fierce, sizeable bounties or economic guarantees (usually in the form of land or leases) were required. Promises were also made about terms of services and whether the regiment would be required to serve outside the British Isles. Each chapter of the book centers on the story of a particular regiment and its role in the events at that time. 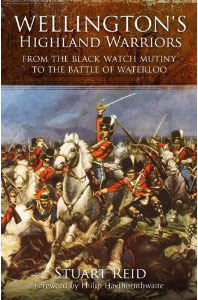 For example Chapter 6 covers the Highland fencible regiments in the suppression of the Irish Rebellion of 1798. Rather than providing an overview of all the regiments, Mr. Reid focuses on the actions of Reay’s Fencibles, the regiment that played a key part in putting down the rebellion. Chapter 7 looks at the Highlanders in India and how critical the 78th Highlanders were to Wellington’s victory at Assaye in 1803. Mr. Reid does not neglect the fight against French. He devotes Chapter 8 to the 71st Highland Light Infantry and does an admirable job of determining who the anonymous soldier of the classic Journal of a Soldier of the 71st or Glasgow Regiment was. This was of much interest to me, since the Journal was the first set of memoirs I bought 35 years ago. (For those who would like to know who the author was, you will have to buy Wellington’s Highland Warriors.) Mr. Reid interweaves the memoirs into the narrative to tell the follow the regiment to three disastrous expeditions: the River Plate in 1806, the Corunna Campaign of 1808 – 1809, and Walcheren in 1809. Wellington’s Highland Regiments has two appendices that are quite useful. The first lists the 35 different regiments that were raised and what became of them. The second appendix has six diagrams that show how the Scots Greys passed through the Gordon Highlanders to make their famous charge. This is a gem of a book that provides a detailed overview of how the famed British Highland regiments came to be. Its strength lies in its explanation of how and why the regiments were raised, rather than a study of the numerous battles they fought in around the world. My only complaint with the book is that the author assumed the reader was familiar with the geography of Scotland and thus would know where the various locations mentioned in the text were. A map of Scotland would have been very useful! This book is a must buy for those interested in the British Army or Scottish history!